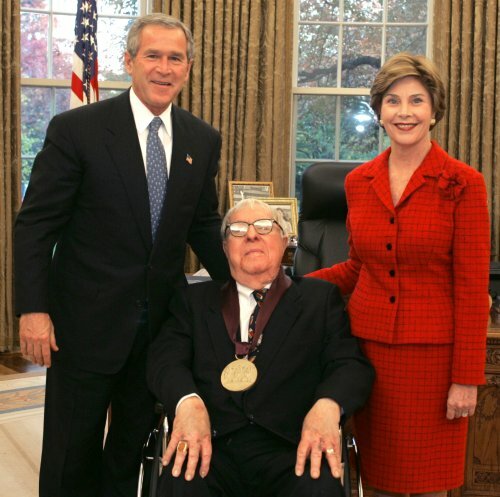 President George W. Bush and Laura Bush present the 2004 National Medal of Arts award to Ray Bradbury. White House photo by Susan Sterner. 2004 National Medal of Arts - Ray Bradbury - Author, Los Angeles, CA. "The author of The Martian Chronicles and Fahrenheit 451, Ray Bradbury is the greatest living American writer of science fiction." Fahrenheit 451 Historical Context - The Life and Times of Ray Bradbury. Timeline. Fahrenheit 451: About the Author: Ray Bradbury (b. 1920) - includes an Interview with Ray Bradbury on January 5, 2005 in Los Angeles, by Dana Gioia, Chairman of the National Endowment for the Arts. From The Big Read, NEA. Grandfather Time: An Interview with Ray Bradbury by Devin D. O'Leary, Weekly Alibi, 27 September 1999. Listen to the Ray Bradbury interview with Don Swaim, 1992 (47 min. 31 sec.) and Ray Bradbury interview with Don Swaim, 1993 (33 min. 47 sec.) from Don Swaim's CBS Radio studio in New York. Webcast by Wired for Books in RealAudio, © Ohio University. Meet the Writers: Ray Bradbury. Biography and interview from Barnes & Noble. Ray Bradbury from Wikipedia, the free encyclopedia. Ray Bradbury Biography from RayBradburyOnline, site created and maintained by a fan of Bradbury's work. American novelist, short-story writer, essayist, playwright, screenwriter, and poet, Ray Bradbury was born in Waukegan, Illinois on August 22, 1920, the third son of Leonard Spaulding Bradbury and Esther Marie Moberg Bradbury. Photos include Bradbury when he was a young boy. Ray Bradbury: Books Are ... "My books? They're the center of my life! They're the center of my guts! The center of my ganglion! The center of my antennae! The center of being alive!" From Forbes Special Report: Books. The Ray Bradbury Image Gallery includes: Numerous Pictures of Ray Bradbury, Book Covers, e.g. Cover to the first cloth edition of Fahrenheit 451, Movie Poster of Fahrenheit 451, and much more. Ray Bradbury is on fire! by James Hibberd. Interview from Salon.com, Aug. 29, 2001. "Author Ray Bradbury, now 81 and recovering from a stroke, has recently become the most sought-after writer in Hollywood." Ray Bradbury Website. Contents include: About Ray Bradbury, Chronology of Books by Ray Bradbury (chronological order/US publications, includes story collections, novels, verse, plays), Articles & Press links, Useful links about Ray Bradbury on the web, Awards won by Ray Bradbury, Personal appearances of Ray Bradbury, In His Words: Happy Birthday to Me! By Ray Bradbury: "Last week I turned 82. 82!" At Home with Ray with video clips, Subscribe to Ray Bradbury Newsletter, Ray Bradbury Forum. Long Beach Reads One Book: Fahrenheit 451. A Center for Educational Technology and Learning (CETL) Multimedia E-book. Page turns are click-and-drag from the lower right hand corner of the book. Click again to drop after page turns. Amazon.com - Editorial Reviews on Fahrenheit 451. "In Fahrenheit 451, Ray Bradbury's classic, frightening vision of the future, firemen don't put out fires--they start them in order to burn books." Challenging Destiny - Fahrenheit 451. Science Fiction and Fantasy Book Review by James Schellenberg. "Fahrenheit 451 is one of Bradbury's most famous books, and it reads like a fever dream -- intensely cinematic, directed by its own weird dream logic, and full of the quality of images that haunt you for days. ... The book is divided into three sections: 'The Hearth and the Salamander' introduces Montag at home and at work; 'The Sieve and the Sand' finds Montag increasingly disillusioned with his society; and 'Burning Bright' concerns Montag's escape and the eventual end of the society he left behind." CliffsNotes: Critical Essays - Introduction to Bradbury’s Fiction from Yahoo! Education - Homework Help. Essays on Fahrenheit 451. Literary analysis of the novel from EDU Essays.com, a commercial enterprise. Only the first 1,000 characters of the essay is displayed. To download the complete version of any essay, regardless of length or quality, payment is required. Fahrenheit 451 from The Big Read, National Endowment for the Arts (NEA). Contents: Preface, Introduction, Historical Context, About the Author, Other Works/Adaptations, Discussion Questions, Additional Resources, Teacher's Guide. Fahrenheit 451 by Ray Bradbury . An Infinity Plus Review by Josh Lacey. Fahrenheit 451 by Ray Bradbury. From Bookreporter.com, a Sci-Fi & Fantasy book review by Judith Handschuh. Fahrenheit 451: 50th Anniversary Edition - Ray Bradbury. A SF Site Featured Review by Chris Przybyszewski. Fahrenheit 451: Preface from The Big Read. The Failure of Fahrenheit 451. Article by Jeremy Smith, Director of Financial Services at the Independent Press Association. Published on 13 October 2003 in Strange Horizons (www.strangehorizons.com), a weekly web-based magazine of and about speculative fiction. "Let's call it Cassandraism, after the daughter of Troy whose prophecies were not believed. ... Fahrenheit 451 has devolved into a near-total fiasco ... Today, no firemen roam the land literally burning books ... but they are merely a dramatization of Bradbury's true fears." The incendiary prophet by David T. Wright. On Fahrenheit 451 by Ray Bradbury, Wright comments: "In it he managed to predict with frightening accuracy such current social pathologies as the dumbing down of popular entertainment and education, our growing addiction to empty sensory stimulation, the rise of random violence among youth, the increasing anomie and alienation among everyone, the cult of pharmaciæ, the cult of consumerism ... The amazing thing is that he did it more than 40 years ago." Ray Bradbury (1920 - ). Internet Public Library: Online Literary Criticism Collection. Criticism about Ray Bradbury. Ray Bradbury: Fahrenheit 451 Misinterpreted from LA Weekly - News. L.A.’s Pulitzer honoree says it was never about censorship, by Amy E. Boyle Johnston. User:Perl/Fahrenheit 451 from Wikibooks. Project presented by Alexander Plank. Contents: Biographical background of Ray Bradbury, Characters, Themes, Conflicts, Review, Resources. Barr's English Class: Fahrenheit 451: 1-31 (Handouts for Students) by Bob Barsanti, High School Teacher. Book-A-Minute - SF/F: Fahrenheit 451 by Ray Bradbury. Ultra-Condensed by Ryan Evans. (SF/F = Science Fiction and Fantasy). BookRags: Fahrenheit 451 Book Notes. A free, short version of a study guide on Fahrenheit 451 by Ray Bradbury. Brief summaries include: Author Biography / Context of the Work, One-Page Plot Summary, Character Descriptions, Object/Place Descriptions, Quotes, Topic Tracking: Fear, Topic Tracking: Indifference, Chapter Summaries - Part 1: The Hearth and the Salamander, Part 2: The Sieve and the Sand, Part 3: Burning Bright, How to Cite Fahrenheit 451 Book Notes in MLA and APA. BookRags: Fahrenheit 451 Study Guide. A more detailed study guide containing free EXCERPTS. Contents: Introduction, Overview, Author Biography, About the Author, Plot Summary, Chapter Summaries, Characters, Setting, Social Concerns, Social Sensitivity, Literary Qualities, Thematic Overview, Themes, Style, Historical Context, Critical Overview, Critical Essays, Media Adaptations, Topics for Further Study, Compare & Contrast, What Do I Read Next? Key Questions, Topics for Discussion, Ideas for Reports and Papers, For Further Study, Sources. Fahrenheit 451 from Wikipedia, the free encyclopedia. Contents include: Plot summary, Characters in Fahrenheit 451, Allusions / references from other works, Ray Bradbury Quotes, References, Printings, Editions of the novel. Fahrenheit 451 - Symbolism. Essay uploaded by CaribTrancechyck to Slashdoc.com. GradeSaver: ClassicNote: Fahrenheit 451 Study Guides. Contents include: About Ray Bradbury, About Fahrenheit 451, Character List, Major Themes, Glossary of Terms, Short Summary, Full Summary and Analysis, Summary and Analysis of Parts I, II & III, Related Links, Suggested Essay Questions, Author of ClassicNote and Sources, Test Yourself! Quizzes, Essays, Forum. JiffyNotes: Fahrenheit 451. Historical Context, Main Characters, Points to Ponder, Did You Know, Plot Summary, Parts 1-3. NovelGuide: Novel Analysis: Fahrenheit 451. Contents: Novel Summary, Character Profiles, Metaphor Analysis, Theme Analysis, Top Ten Quotes, Biography of Ray Bradbury. Schmoop.com. Fahrenheit 451 by Ray Bradbury: Analysis, summary, chapter-by-chapter, themes, characters, notes, study questions, literature. SparkNotes: Fahrenheit 451. Contents: Context, Plot Overview, Character List, Analysis of Major Characters, Themes, Motifs & Symbols, “The Hearth and the Salamander - The hearth, or fireplace, is a traditional symbol of the home, and the salamander is one of the official symbols of the firemen, as well as what they call their fire trucks. Both of these symbols have to do with fire, the dominant image of Montag’s life." The Sieve and the Sand, Burning Bright, Important Quotations Explained, Key Facts, Study Questions & Essay Topics, Quiz, Suggestions for Further Reading. Censorship and Fahrenheit 451. Webquest designed by John Loonam for Tenth Grade, Humanities High School, NY. Contents: Introduction, Task, Process, Evaluation, Conclusion. Fahrenheit 451 Lesson Plans. Suggested teaching schedule for a 10 class study of Ray Bradbury's Fahrenheit 451, Teacher's Guide from The Big Read, National Endowment for the Arts (NEA). See also Fahrenheit 451: Discussion Questions. Fahrenheit 451: A Novel by Ray Bradbury. Discussion Questions from Reading Group Guides. Guide by Alice Jones-Miller, editor and writer, Westchester County, NY. Includes an Excerpt from Fahrenheit 451. Fahrenheit 451 - Content and Discussion Questions. Assignment for teachers taking the course: answer the Content Questions, use the possible Discussion Questions in groups, complete the Activity: Literary Devices, and create their own literature activities for Fahrenheit 451. From READ 512, Adolescent Literature, a course offered by Paul Schafer, Ed.D., Associate Professor of Education, St. Bonaventure University, NY. Purpose of this course: enjoyment of adolescent literature: "The more you enjoy adolescent literature, the greater the likelihood of having your students enjoy their literature." Fahrenheit 451 - Ray Bradbury. Theme: Censorship and the value of literature for Grades 10-11. Discussion of censorship, Interpretation of quotation, Cross-curriculum activities, and Research assignments. Language Arts: Novel Guides from ClassZone.com. Fahrenheit 451: Written by Ray Bradbury. High School Teacher's Guide by Alice Jones-Miller, from Random House. Contents: About the Book: Plot Summary, About the Author, Discussion and Writing, Suggested Activities, Beyond the Book: A Note on Censorship ... "Your students may be especially interested in investigating and debating school newspaper and textbook censorship, issues which affect them most directly." Ray Bradbury: Lesson plans for Fahrenheit 451 and more from Web English Teacher. Teaching Fahrenheit 451. Brief description of worksheets with suggested activities for students created by Bernd Wahlbrinck, a teacher of English for over 20 years at a "Gymnasium" in Northrhine-Westfalia, Germany. Worksheets are available online for 40 cents per worksheet with a taster offer of 1 free worksheet of your choice. Vocabulary Classic Texts: Vocabulary from Fahrenheit 451 by Ray Bradbury gathered by Jan and Carey Cook for Vocabulary University®. Audio Excerpt of Fahrenheit 451 - Written by Ray Bradbury and read by the author himself, from RayBradbury.com. Fahrenheit 451 (1966) from Internet Movie Database (IMDb). Directed by François Truffaut, Writing credits Ray Bradbury (novel) and Jean-Louis Richard (screenplay). Genre: Sci-Fi / Drama. Plot Outline: In an oppressive future, a fireman whose duty is to destroy all books begins to question his task. Site includes: Cast, Crew, Oskar Werner plays Guy Montag, Julie Christie plays Clarisse/Linda Montag. Reviews, Plot Summary, Comments, Discussion. Goofs for Fahrenheit 451 (1966), Photo gallery for Fahrenheit 451 (1966). Fahrenheit 451 (2007 film) from Wikipedia, the free encyclopedia. The IMDB currently credits Frank Darabont for writing and directing and expects a release date in 2007. More info to follow. Fahrenheit 451: Movie Review and Sounds from Destitute Gulch. Includes a film review, color images, short wav sound files, and a fiery video clip from the 1966 movie starring Oscar Werner and Julie Christie. Fahrenheit 451: Topic: Science Fiction. A commercial site for TeachWithMovies.com Learning Guide. The SciFlicks Guide - Science Fiction Cinema: Fahrenheit 451. All about Fahrenheit 451: movie collectibles (movie, soundtrack, posters, books, auctions) and forum, facts, sounds, pictures, quotes, links and more. Book Burning from American Library Association (ALA). Site includes quote: "Where they have burned books, they will end in burning human beings." (German: "Dort, wo man Bücher verbrennt, verbrennt man am Ende auch Menschen.") - Heinrich Heine, from his play Almansor (1821). Contents include: Book Burning in circa 200 B.C.E., Book Burning in the 16th Century, Book Burning in the 19th Century, Book Burning in the 20th Century, Nazi Germany, Book Burning in the 21st Century. Book burning from Wikipedia, the free encyclopedia. Contents include: Historical background, Chronology of notable book burning incidents. Book Burning - Photography. Photos include: At Berlin's Opernplatz, the burning of books and other printed materials considered "un-German" by members of the SA and students from universities and colleges in Berlin. Germany, May 10, 1933. The Burning of the Books in Nazi Germany, 1933:The American Response by Guy Stern, from Simon Wiesenthal Center Multimedia Learning Center. Fahrenheit 451 by Ray Bradbury: Critical Essays: The Issue of Censorship from CliffsNotes. Harry Potter and the Ministry of Fire by David Serchuk, from Forbes Special Report: Books. "In August 2003, two Michigan pastors, T.D. Turner Sr. and son T.D. Turner Jr., took a stand against sorcery by burning a Harry Potter book outside their Jesus Non-Denominational Church. ... One pastor, Douglas Taylor of the Jesus Party in Lewiston, undeterred, slashed and destroyed 12 Potter books instead. ... Ray Bradbury, however, thinks that Taylor is deluded. The 86-year-old author of the anti-censorship novel Fahrenheit 451 is a passionate advocate of free speech and believes Taylor and his ilk are at best clueless about their actions." Burning Bright. A general knowledge quiz crafted by Trivia Architect towman931. 10 multiple choice questions with answers and explanatory comments provided, as well as percentage of players who got the correct answers. Fahrenheit 451 from Game Downloads. Comment from reviewer: "A nice graphical textadventure. Not following the book at all. In the game your mission is to burn all books, but doing so you only want to read them and are not willing to burn them anymore..."
'Fahrenheit 451'. Quiz crafted by Trivia Architect kknesh. 10 multiple choice questions with answers and brief comments provided at the end. Includes percentage of players who got the correct answers. (Note incorrect spelling of "Ecclesiastics" - One must be a member or create a New FunTrivia Account to report errors). Fahrenheit 451 #2 Challenge Board - Jeopardy Game. Trivia over symbol, character, quote id, and technology from the novel. One or two players. Choice of Flash or HTML version. Must know novel well in order to play this game. Fahrenheit 451 Quiz by Sarah. 15 multiple choice questions, from triv.net. If you make a mistake you have to go back and answer the same questions again until you get all the answers right. GradeSaver - Fahrenheit 451 Quiz 1. Excellent quiz. 25 multiple choice questions. Provides you with a score. You can review your answers after completion. All correct and incorrect answers are highlighted. He who destroyes a good Booke, kills reason it selfe. An exhibition of books which have survived Fire, the Sword and the Censors, from University of Kansas Library 1955. Memorable Quotes from Fahrenheit 451 (1966) from Internet Movide Database (IMDb). Rags to Riches: Part II Fahrenheit 451 Test Review Game . Play this 'Who Wants to Be a Millionaire' inspired game. Your choice of Flash or HTML version. You can play the game multiple times due to a large database of random questions. You have 3 clues/hints or life-lines to help you. Sorry, game over if you make a mistake. You have to start all over again. Science Fiction Inventions from Fahrenheit 451 by Ray Bradbury. From Technovelgy.com - where science meets fiction™. Read details on inventions: Air-Propelled Train - silent mass transit, Big Flue, Electric-Eyed Snake, Green Bullet - carry your mentor with you, Mechanical Hound - a fireman's best friend, Parlor Wall (TV Parlor) - original big screen TV, Salamander - it was a pleasure to burn, Seashell Radio (Thimble Radios) - original walkman (or ear buds), Spot-Wavex Scrambler - personalized mass media. Trivia for Fahrenheit 451 (1966) from Internet Movide Database (IMDb). Fahrenheit 451 - The temperature at which all books catch fire and burn.... Colorful and attractive site using a beautiful template from Freewebs.com, with no author stated (likely by someone named Brianna). Has lots of bubbles following your cursor everywhere you move. Looks like a student project with a few typographical, spelling and grammatical errors. No contact email provided to report errors. Author demonstrates an excellent understanding of the novel and is brilliant in her analysis. Contents: Intro, Characters, Conflicts, Vocabulary, Theme / Connecting, Something to Think About, Guestbook.